I know, it has been too many days since I made an entry. But believe me, I have been busy. I have been out on our boat two times since arrival and I think I am prepared for my test which is coming up on March 26 and 27. I'm not entirely clear on what will be covered but I think I can do what is needed. I have cleaned the boat and supplied the pantry as the instructor will be staying on board for one night. He is driving over Monday morning from east of Antwerp. There has been one snag and that is with having crew on board to handle the lines. The crew has abandoned ship as they will be headed towards the UK for 5 days. I have checked with the testing people and they say not to worry. So I don't. With the boat all polished up, I welcome Michiel on board Monday morning. I was expecting a 26 year old but instead I get a well experienced sailor. Michiel is qualified in the many aspects of boating and has been on the water from a young age. He seems like someone I can listen to. This is important as I am told that those who fail fail to listen. I was expecting to receive two boating licenses but I am told that I will be getting a total of three. This is a point I did not understand. For convenience sake, I had arranged to have the testing done on my boat rather than going off some place to be trained with two or three other classmates on a boat that no one is familiar with. I think this will help. So Michiel's plan is to head off immediately in the direction of Nieuwpoort. We must travel upstream a short distance to turn around and my training begins right away. We spend some time in the stream doing 180 degree turns. His style for turning is a bit different from what I have been shown previously. Live and learn as both methods may be useful. We steam towards Nieuwpoort and have only one obstacle in the way; a bridge that must be lifted for us. Normally you would call on the VHF radio or you might use your cell phone to contact the people that control the bridge. We try the radio with no success but are able to raise the proper contact by phone. This bridge has cameras and after the area is checked, the bridge is raised for us. 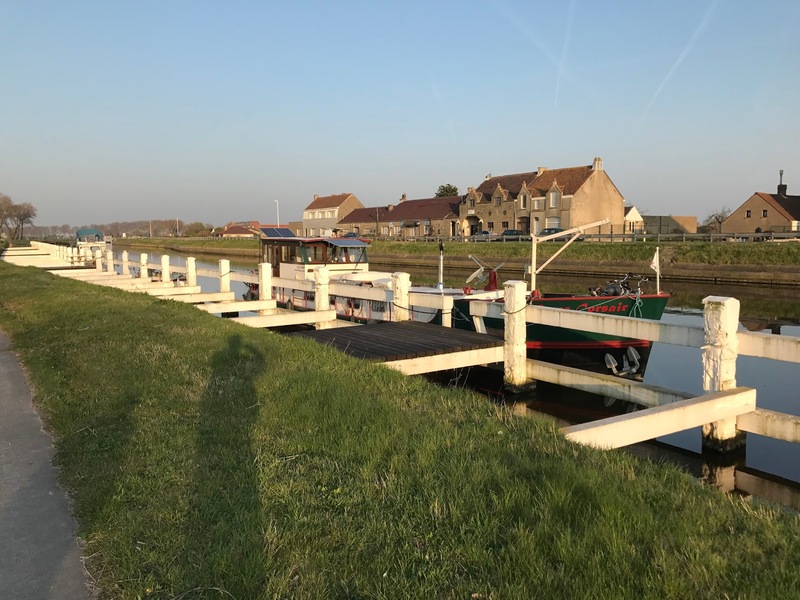 Near Nieuwpoort there is a large marina and a large body of water in which we can play. Michiel is showing me how to do various maneuvers and how to control the boat. I am surprised that he is able to do things with this new boat having been on board for just several hours. Can I do it? We tie up at a broken down dock and have lunch. We talk about many things and even things not boating related. After lunch, we again do more maneuvers then head towards a lock. Again we have some trouble raising the staff by radio and revert to using the phone. Some maintenance is being done on the lock but they will allow us through. This is a big lock; my boat easily fits in. So in that regard, nothing to get excited about. Leaving the lock I must make a 290° turn to port to proceed down an unused canal. We do more maneuvers and finally tie up for the day in a section of the canal. Michiel is constantly testing me about things that I should know but some are things that I have already forgotten. Trying to learn about boating from Thomasville is not the same as being on the boat and doing it. I wonder how I am doing? The following day, we do more maneuvers and proceed through the same lock to the other side where we again do maneuvers. I want to try some things in this open space and Michiel allows me to horse around. But it is useful, I think. We head southeast on the canal and back to Diksmuide. I pass, but I wonder. Michiel suggests that I am above average for students taking this type of exam. Most of the skills I need will be learned on the job. In town I must have three photos made for the three different licenses. We have lunch, get the pictures made, and Michiel goes home. This same day I make the acquaintance of a gentleman that is 86 years old and travels on his barge alone. He has been doing this for nearly 15 years. As I will need to move the boat by myself on occasion, I want to know how he does it. I find him home and he offers to speak with me and pours a little wine. Is this his secret to boating success? He is leaving the next day for France and I ask if I can travel with him for some time to see how he handles the boat. He agrees and we arrange to meet the following morning. It's going to be a great day, warm with sunshine. We head up the river and pass through a controlled bridge; we enter a lock of an old design, not typical. We travel through some interesting farmland and seeing sites from the back door. More bridges. We stop for lunch which he prepares below; also a little wine. When we go through the next lock, I will take my bike and depart for Diksmuide. But bad luck sets in; the last lift bridge will not move and there is nothing to do about it. They suggest that we turn around and head back to the most previous bridge where we can tie up. We do, and when we arrive, I leave the barge for my pedal home. Thanks, Brian. See you in the fall. Today I use my bike to collect laundry and dry cleaning that I took in more than a week ago. It is an awkward load on the bike but I get it back to the boat OK. I also want to stop at an auto supply store for supplies for the engine room, some filters and belts. While I have all the correct numbers for these parts they are not sure that they are correct and ask me to bring in the originals. Since they are on the far side of the town this means another trip on the bike but that is fine with me. On my way back through town, I stop at the bike store and ask Luc to make some adjustments to my new bike. I have received a message that the lettering for our new name for the barge has arrived at a store in town and I must collect it. I will do this when I return to the auto parts store. After a short lunch I'm on the bike again and I am able to purchase the spare parts for the engine room. But no new wiper blades; this might be a problem as the design is old. I then stop at a phone store which also serves as the receiver for shipments into town. I have not seen a UPS truck yet. I get a short round tube that has the lettering and return to the boat. The new name will not go on until I receive word that our Belgian registration has been approved. There remains problems with this. On two Belgian fronts, let me update. On Monday I received word from the Belgian consulate in Atlanta that they still did not have what they needed for my visa. They emphasized that they wanted my monthly income. But I don't have one. So I call to Atlanta and ask some questions and propose this: how about if I take my annual income and divide by 12 and put this in a spreadsheet. Would this be OK? Yes, it seems it might. My question is why can't they divide by 12? But by Wednesday I receive word that my visa has been approved. While this is good news, it also means I must return to Atlanta to collect it. So I will return in May and come back to Belgium with Marianne. Regarding the boat registration, I have enlisted the help of my sister-in-law, Monique, as she can speak Dutch and that may be helpful. She has learned that the boat registration people need a document that says I reside in the US. I have previously provided photocopies of my passport and my Georgia driver's license which lists my address. Not good enough. Marianne emails me copies of bills with our address; they say they cannot use those. I note that we do not have national identity cards like countries in Europe. What is the boy to do? They suggest that the American embassy can certify my address. So I call the embassy in Brussels and ask if they can help. Not likely. They cannot provide any document that says I reside in the US. The most they can do is suggest that I create a document stating that I live in the US; the embassy can notarize it for me. I ask Monique to ask the boating people if this will be enough. We are holding our breath to learn their answer. I am beginning to consider some small work on the boat. The big chain that moves the rudder is too loose but has no idler on it. I want to create something that I hope will make the turning of the wheel smoother. Also, the horn does not work and should. I have looked under the control panel and there is a spider's web of wires going everywhere. I can see a hose coming from the horn trumpet, through the dashboard to a small compressor but it is under all the wires and I am afraid of moving something and causing something not to work. But a bit of luck perhaps: down in the engine room I now see a new compressor. Someone has purchased it but did not want to take the effort to install probably because of all of those wires that are in the way. Maybe I should sit back and think about this too. And maybe good I did. There is an oil port on the top of the old compressor (but not on the new model). So I squirt in some oil and the horn comes alive. Will wait till I am away from town to see if this fix is the real thing. This past week I became acquainted with a man from Poland - Artur. He is in Belgium working for a company in the next town over. He wants to live on a boat and perhaps purchase a boat. He is exceptional with machinery and has a design for hydroponic plant growing that he thinks the Walloon government might be interested in. In several weeks he will have a sit down with a committee to show them his design which has its origins with NASA and the space lab. But what he really wants is a boat to live on. He reminds me a lot of our friend from Latvia. Both eager beavers. We will see what happens and in the meantime he has offered to make the idler for the chain drive rudder system. If the weather is good next Saturday, he and I will cruise up the river and up a canal to Ypres, a famous area and town during WWI. Amazing challenges and attitude- I admire you! You will get your Visa and things that needed to be fixed on your barge will be up to par. Honk that horn once for me as you head out!